The book covers a variety of skills, including poetry, descriptive writing, story plotting, character development and dialogue. 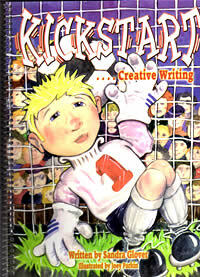 This excellently written teachers' resource will fire pupils' imaginations and make creative writing fun. Think about the kind of story you want to write. Is it a mystery, a ghost story, a romance, a fantasy, science fiction, animal story, comedy or something different? It might be a combination of more than one. Create a main character. Try to imagine your character clearly. How do they dress, speak, act? What do they like/dislike? Who are their friends? When you start to write try to be your character; think and feel as they would. Give your character a problem. It might be something to do with family or school. It might be something they desperately want but can’t have. Or maybe someone or something is scaring them. They might be trapped somewhere or lost! Think about how your character could solve the problem. Put lots of obstacles and difficulties in the way to stop them solving the problem easily. The obstacles might be other people, physical obstacles like storms, mountains and injuries or maybe it’s a weakness in your character that holds up their progress like cowardice or fear. Work out how they will overcome all the difficulties. Think up a neat ending…before you start to write! It was happening again; that weird feeling that someone or something was following me. Jamie slowly approached the house. He didn’t want to go in there but he knew he must. I wish I’d never gone to the fair. There was something odd about the new girl/boy. Five Top Tips for young writers. Read lots! Read magazines, books, newspapers, cereal packets, anything! Keep a note-book. Jot down any good ideas; anything unusual that you see, read or hear. Practice your writing as often as you can. Try a poem for someone’s birthday. Write a funny letter to a friend. Write to a newspaper or magazine about something that annoys you. Write and illustrate a story for a younger brother/sister/friend. Never be satisfied with your first draft. There’s always something that can be done better. Be proud of your writing and have fun!